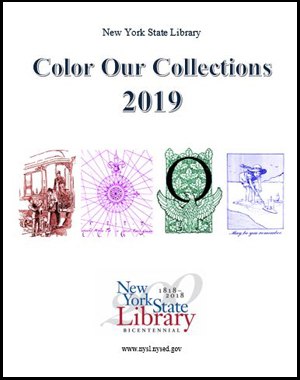 February 2019: The NYS Library is once again joining other libraries around the country and the world for #ColorOurCollections. We recommend printing the document out single-sided. Originated by the library of the New York Academy of Medicine, #ColorOurCollections is "a week-long library & special collections coloring fest on social media" running February 4-11, 2019 that invites both children and adults to "explore, color and connect with libraries and their collections." Where are the NYSL images from? decorative letters from a 1920 conference souvenir and from 19th century periodicals. Can't get enough of coloring? NYSL 2018 coloring pages (pdf, 4.5 MB) -- Ten images ranging from decorative arts to heraldry/genealogy to political cartoons from the struggle for women's suffrage, drawn from books, periodicals, newspapers and artwork in the Library's collections. NYSL 2017 coloring book (pdf, 2.1 MB) -- Thirteen images from early 20th-century women's magazines in our periodicals collection, including a mix of advertising images, cartoons and article illustrations published between 1909 and 1921. Visit The New York Academy of Medicine Library's Color Our Collections page for links to many additional coloring books/pages from other libraries and cultural organizations participating in #ColorOurCollections.